I spent a couple of hours normalising the vocabulary used by volunteers (so that, for example, the pill and contraceptive pill were the same) and wrote some code to index the articles by the thing to which they refer. 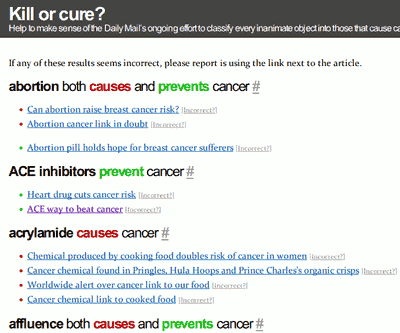 All this means that you can now see a long alphabetical list of items, colour-coded depending upon whether the Daily Mail says that they cause or prevent cancer—or both! Each claim is accompanied by a link to the relevant article. Thus, we now know that artificial light causes cancer, coffee both causes and prevents it, and wasabi seems pretty healthy. There are a few errors due to bogus submissions, so I’ve added a reporting mechanism. Just hit the link if you see anything untoward. Previous: IE6? Not on my internet!